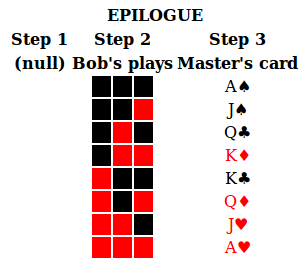 Continuation of: "Sub-puzzle: Master and Slave versus Bob the Violent but Honest Psychopath" and "Master and Slave versus Bob: easy version"
The hard version is identical to the easy version (see link), except: the Prologue has only 2 Red/Black rounds, but Bob only grants them 2 Mulligans. Your task is, as before, to come up with a Deck, and a definition for Large and Small amounts of information, and GUARANTEED (not probabilistic) survival strategies for the Main game, Prologue, and Epilogue. You may wish to start from a solution to the previous puzzle first, and see what needs to be patched. the top four ranks from a standard deck (16 cards). These correspond to the odd parity cases (3-1 split). The colour of the card is the majority colour, and the rank of the card is the position of the minority colour. I have no nice description for the difference between clubs and spades, and between hearts and diamonds. It is a patch to make things work. You may wish to start by coming up with an unpatched solution based on this, and see where it needs to be patched. knowing 1 of 10 overlapping cases: you know the rank and colour of the card (8 cases), but you don't know the suit; OR you know the next card is a Q/K of spades, OR you know the next card is a Q/K of hearts. In the last two cases you don't know the gender. knowing 1 of 2 overlapping cases: either you know the card is not a spade; or else, you know it is not a heart. Nobody got the easy version, so I won't wait to post the answer for the hard version. The top four ranks from a standard deck (16 cards). A Large amount of information means knowing 1 of 10 overlapping cases: you know the rank and colour of the card (8 cases), but you don't know the suit; OR you know the next card is a Q/K of spades, OR you know the next card is a Q/K of hearts. In the last two cases you don't know the gender. And a Small amount of information means knowing 1 of 2 overlapping cases: either you know the card is not a spade; or else, you know it is not a heart. In fact, it turns out the Master doesn't need Ace/Jack of Clubs/Diamonds, so we could use a 12-card deck, but it won't harm them, I'll keep them in anyway. it is different from the easy version, as he does not know colour, he only knows "not spade" or "not heart". However, it is still solvable. If you check the table, you see "not spade" still tells the slave the next two rounds are not black. Thus he can play red twice, and will make at most one mistake. If one mistake, the Master's play in that round tells him what to play for the third round. If zero mistakes, he still has one Mulligan left so it doesn't matter what happens on the third round. And the "not heart" case is the colour-reverse of this. And there is nothing to do in step (6). - Survivable: each row states the right number of Mulligans remaining, and, when it is 0 the Slave has a large amount of information. - Valid: the Slave's plays only depend on information from previous rounds (unlike the Master, who finds out Bob's plays in step (2)). So here, the Slave plays black on the first round, and, plays black in the second round unless the Master and Bob both played red in the first round. This is as described in the other answer, except for the cases where Bob plays red-black-black-red or black-red-red-black, and Bob's card is an ace. In those cases the Master would play a king of one colour, according to the other answer, but actually he plays a Jack or Ace of the other colour. This "exceptional ace" case is a Kludge. The difference between clubs and spades, and between diamonds and hearts, is another Kludge. - If Bob's plays are even, and it is not an "exceptional ace" case, the Slave will make one mistake. The position of the mistake tells the Slave the rank of Bob's card. The colour of the Master's play in that position tells him the colour of Bob's card. Thus he has a Large amount of information about Bob's card. - If Bob's plays are odd, the Slave will make no mistakes. - If the Master's card is black and Bob's card is a heart, the Master intentionally makes one mistake, in one of the last three rounds. If ace, the fourth round, if jack, the third round, if king or queen, the second round. Thus the Slave knows rank and colour of Bob's card, or, knows that the card is either a queen or king of hearts. Either way a Large amount of information. - If the Master's card is black and Bob's card is not a heart, the Master does not make a mistake. This tells the Slave that Bob's card is not a heart. Thus he only has a Small amount of information about Bob's card, but they still have one Mulligan. - If the Master's card is red, same as above, but swap hearts and spades. - If it is an "exceptional ace" case, the Slave will get the first round right, but the Master intenionally makes a mistake in the first round. 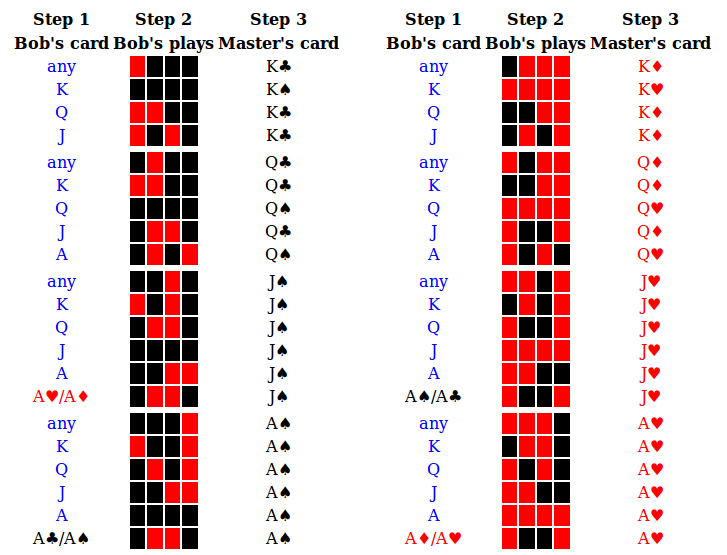 This signals the exception, and based on the rank and colour of the Master's card, the Slave knows Bob's plays are black-red-red-black or red-black-black-red, and that Bob's card is an Ace, and the colour of Bob's card. 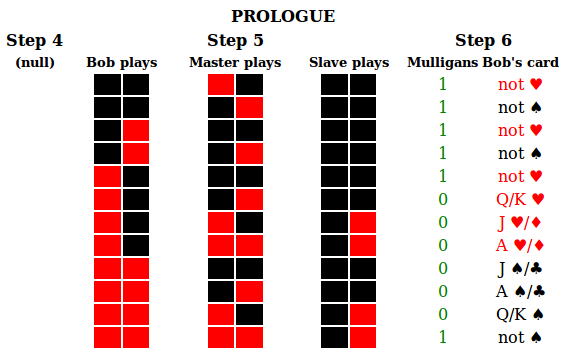 As with the Prologue you can check this is survivable, complete (covers the cases where the Master would have played a queen or king of spades in step (3)) and valid (the Slave always plays black on the first three rounds, and red on the fourth round if Bob played red on the second round, so he is only using information from previous rounds). The tenth case is where the Slave knows it is a queen or king of hearts: the colour reverse of the previous (swap red and black, spades and hearts, clubs and diamonds). One case is that he knows the Master's card is not a spade. This is a total Kludge. The 'blue' boxes means the Master could play either colour, and this tells the Slave the colour of Bob's card, when the rank is given. When the rank is not given ("any"), then red means "not a spade" and black means "not a heart" (and there is one Mulligan left, so a Small amount of information is sufficient). - For the first round, the Slave plays red. - For the second round, the Slave plays black if, on the first round, Bob played red and the Master played black. In this case the Slave plays black on the third and fourth rounds as well. - Otherwise the Slave plays red on the second round. - In that case, for the third round, if, on the first round, Bob and the Master played black, and Bob played red on the second round, the Slave plays black on the third round. In this case the Slave plays black on the fourth round as well. - Otherwise the Slave plays red on the third round. - In that case, for the fourth round, if Bob plays red-red-black on the first three rounds, and the Master plays red-black on the first two rounds, the Slave plays black on the fourth round. - Otherwise the Slave plays red on the fourth round. The other case is where the Slave knows the Master's card is not a heart. This is the colour reverse of the above (swap red and black, spades and hearts, clubs and diamonds). - Play the each game up to step (3). Start with the Epilogue, then the Nth copy of the Main game, ..., then the 1st copy of the Main game, then the Prologue. The Master's card in step (3) becomes Bob's card in step (1) of the next game. - Play each game starting from step (4). Start with the Prologue, then the 1st copy of the Main game, ..., then the Nth copy of the Main game, then the Epilogue. The Slave's decision in step (6) becomes Bob's decision in step (4) of the next game. Not the answer you're looking for? Browse other questions tagged mathematics strategy game or ask your own question.